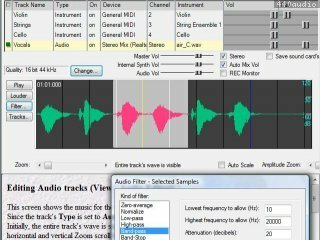 Anvil Studio est un programme gratuit pour Windows d'enregistrement multi-pistes, composition, édition de fichiers audio et MIDI. Des effets intégrés incluent délai, égalisation, changement de volume, filtrage. Automation, plug-ins DirectX et SoundFonts sont supportés. Anvil Studio est conçu pour fonctionner avec plusieurs accessoires optionnels dont impression de partition, exercices de piano, exercices d'entraînement de l'oreille, effets et instruments VST, matériels ASIO. The free version of Anvil Studio now supports ASIO, because some soundcards only work well with ASIO drivers. Fixed a few problems with the display of enharmonic notes. Added File / Print Preview with a keyboard shortcut when the Print-Sheet accessory is installed. Made changes so that it works with more VSTs, including Antares Audio Technologies. Free version now supports a single VST-Effect or VST-Instrument. Pro-Mix accessory supports an unlimited number. In staff editor, you now can click on a single note of a chord and edit operations will only affect that note instead of all notes that occur at the same time. The selected note is highlighted with a rectangle drawn around it. When a chord is selected, the entire chord's duration can be changed in the Properties window. Improved usability of Piano Roll, Add Sounds button. When set to variable, it works as it has in the past, evenly spacing notes across the line, fitting as many bars onto the line as possible. When set to any other value, it evenly spaces notes across each bar, keeping a fixed number of bars close to equal width. Since version 2013.04.02, clicking to changing the song's position caused the Tempo display to always be 1-click behind. Fixed problem where if VU was pressed before recording of an audio track started, it would not capture the start of recording. Fixed several other minor problems. Fixed a problem with automatically updating accessories with the View / Update menu. When loading some MIDI-Format-0 files created by other MIDI editors, that had ResetAllController or General MIDI Reset System Exclusive events, tracks were incorrectly played with a Piano sound. It also sometimes incorrectly reordered some MIDI events that occurred at the same midi-tick time. Anvil Studio and all accessories are now based on .Net 4.0 which is automatically downloaded and installed if necessary. Improved File / Export Mixed Audio. Fixed problem in version 2013.05.02 where if 2 audio tracks were simultaneously recorded from the left and right channels of the same device, they were both an octave too high. Added menu Track / Repair in case you don't want to repair all tracks with File / Repair Song. File / Repair Song and Track / Repair can be interrupted by pressing the ESC key. Start menu item is now "Anvil Studio" instead of "Anvil Studio 2012". On Windows XP and later, it now supports importing and exporting .ogg audio files as well as any audio file format that you have a DirectShow or ACM Codec installed. Only download Codecs from trusted sources, as they are a common vehicle for viruses. Fixed a few Import / Export problems. The Rewind button sometimes caused extra spaces to be drawn on the staff. Added a native Flanger effect. Click the type column to convert existing audio tracks between 16/24/32 bit. Drag tracks up and down the track list. Fixed a problem from version 2013.04.01 where Importing certain audio files displayed a memory-reference exception. Fixed a problem where it was displaying dots in the wrong fret location on the guitar while entering a chord. Under Windows XP and later, File/Export Mixed Audio and File / Export Active Track can now read non-WAV audio formats (.wma, .ogg, any format with a Windows ACM codec) as well as .WAV files with different sample rates than the current song. With Windows 7 and later File/Import and Track/Create/Audio by importing can now import and convert non-.WAV files (.aac, .mp4, .m4a, .wma, .ogg, etc.) as well as .WAV files with different sample rates than the current song. If you change your soundcard sample rate, e.g. from 44100 to 48000 samples per second, it will now automatically convert your audio tracks while the file is loading. You can now copy and paste between 16, 24 and 32-bit (floating point) audio tracks. Improved the Delay effect by adding a Feedback control. Works with VST-Instruments that have over 128 banks of programs, such as the Arturia Prophet 5 and Proteus VX. Works better with the Proteus VX, and those like it that provide patch names. Changing the key signature in the middle of a track sometimes got confused. In rare situations, selecting Menu View / Keyboard + Guitar properties could report an error. Replaced Staffs per page control with Note size control, while preserving layout of existing song files. Whenever Note size, Notes per line, or Staff height are adjusted, an image like this gives a preview showing how notes will appear on the page, drawn to scale. On metric systems, the scale is shown as 2 cm instead of 1 inch. Added a Conductor's score Score Option Show track names above staff. When this is not set, track names are printed to the left of the printed staffs. Added an option to use the full screen (several staff lines) to display and edit a single track. When loading songs that have time or key signatures saved in the invisible first track, that is now used as the default time and key signature for all tracks. Added an option to View / Options / MIDI, to the list Anvil Studio action to cause by MIDI Event, named Advance Playlist. This allows you to trigger a MIDI event that advances to the next song in the current play list. Fixed Edit / Paste Special problem where it was sometimes pasting lyrics for one note beyond the last note in the clipboard. Fixed problem where View / Upgrade was saying version3.htm was in use by another process. On Windows XP when Multi-View was active, moving the mouse around, note properties pop-ups sometimes left blank spots on the display. Print Sheet Accessory: Added Show track names above staff checkbox to File / Print / Conductor's Score Options. It now prints custom fonts, e.g. 13/16, with the correct font. Performance Tool Pack Accessory: Controller tool could report division by zero error when very unusual MIDI file was currently loaded. Added Use Crochet, Quaver, ... for note lengths checkbox to View / Options / Staff. Minor improvements for note rendering on the staff. When a dynamic was inserted via Edit / Insert / Notation / Dynamics at the same place as a time signature, the time signature was getting ignored. System.UnauthorizedAccessException: Access to the path 'C:\Users\(name)\AppData\Local\Anvil Studio' is denied. Was drawing horizontal staff lines too thinly with some printers in toner-saver mode. Made several improvements to appearance of notes displayed on the staff. The Track / Merge menu now has better support for SATB (Soprano/Alto/Tenor/Bass) scores. When using View / Performer with a MIDI Controller tool, it was possible to get a division by zero error. When running on Windows XP, it was possible to right-click a note within a chord and select the Properties menu and not be able to change the note's Pitch. When pressing the button that changes between horizontal and vertical layout in the Piano Roll editor, it was possible to get the error "Index was outside the bounds of the array." Sometimes, the error "Value cannot be null.Parameter name: image" was reported. Better support for SATB (Soprano/Alto/Tenor/Bass) tracks. Start with a song with 4 tracks, one each for soprano, alto, tenor and bass parts. For soprano and tenor tracks, set the checkbox "Force stem to point up". For alto and bass tracks, set the checkbox "Force stem to point down". Create a new track, named SATB. Select Track / Merge, and select . New version works well with audio drivers that are configured for 5.1 or 7.1 surround sound, where in previous versions for audio drivers that didn't support the SpeakerFill enhancement, it would report Unsupported Format 88890008. The free version now supports audio with up to 192000 samples per second, so that it doesn't prompt you to Change the Audio device to match Anvil Studio. File / Export Mixed Audio and recording Audio tracks now work well when the MIDI filename has Cyrillic or other non-ANSI characters. Fixed a problem that sometimes generated a Memory Reference Error. Added ability to create, record, and edit 32-bit Audio tracks when Multi-Audio, Combo Accessory Pack, or Anvil Studio Works accessories are installed. This requires a soundcard that supports 32-bit recording. Added Help / Online Forum menu. Please use it to add your questions, share your insights, and suggest new features. Made several improvements to File/Export Mixed Audio, including fixing a problem that sometimes caused File/Export Mixed Audio to generate distortion in DirectX mode. Added button to toggle Piano Roll between horizontal and vertical. Added Wide Keyboard size property. Fixed a problem with Audio Editor's High/Low-Pass filter. If View / Mixer's Instrument column is set to none, no Program Change event will be output for that track. Added Search for... button to audio editor. Fixed a bug where the cursor would sometimes disappear from the Audio editor. Fix a bug with File / Export Mixed Audio that was introduced in version 2012.11.01. Improved the way notes are displayed on the staff, ensuring notes line up properly, and displaced notes are displayed on the proper side of the stem. Improved the way DirectX mode works when VST-Instruments are loaded. Improved the EQ effect, including adding a checkbox to its properties window "Settings remain the same for duration of the track". When unchecked in a Pro-Mix version, the controls represent the track's EQ settings at the song's current position, because the EQ settings can change at different song positions. Fixed a problem that prevented selecting both clefs when lyrics were hidden. Added support the fretboard, TAB editor and Percussion editor when the Copy Me accessory is active, so that when the mouse moves over a note, the correct fret position or drum is highlighted, and when the Step button is pressed or MIDI event occurs, it works with those editors as well. Dragging notes from the palette to the staff now works properly when the Triplet, Quintuplet, or Septuplet checkbox is set. When Pro-Mix is installed, and 2 or more MIDI Out ports have the same name, e.g. USB Midi, Anvil Studio remembers which synthesizers were connected to each from one session to then next. Able to load more VST-Instruments including Proteus VX. Now runs on systems that don't have .Net 2.0 installed, but do have .Net 4.0 installed. Improved ability to select, move, and stretch symbols like slurs, crescendo, etc. Improved the Staff editor's Chord Builder tool. Print-Sheet accessory now allows more header lines. Some minor problems were also fixed. Anvil Studio now works well with more VST-Instruments, including the Garritan Aria Player. File / Repair Song deletes redundant, unnecessary events. File / Save deletes all EndOfTracks except the last one. Added Chord Builder tool to the staff editor. Insert tempo changes at the current song position by clicking the Tempo icon at the top of the screen. Made several minor improvements to the staff editor. File / Export Mixed Audio sometimes generated distortion when set to ASIO mode. Added Chord Builder to staff editor. Added checkbox to Key Signature and Custom Time Signature dialogs to allow changes to apply to all tracks. Enhanced Track/Merge menu - it includes an option to merge all enabled tracks, and supports filtering out short notes. Added a Zoom control to the TAB viewer. Since version 2012.06.01, the View / Lyrics menu would sometimes not cause lyrics to be visible. More VST-Instruments are now supported, including the Korg M1 Le. Works well with more VST-Instrument Editors. When dragging a note from the palette to the staff, a large display now show's the new note's time and note's name as you drag the mouse. You can lock the note's pitch by pressing the shift key and then continuing to drag the mouse to select the time. If the Ctrl key is pressed while dragging the note, you can insert the new note at locations that overlap with existing notes where the Show: field controls the time-increment steps. An example where this is useful would be, if a measure had two half notes, and you wanted to add a quarter note to the last beat of the measure. Audio Samples can now be dragged to the Staff from the Audio Samples list below the staff. 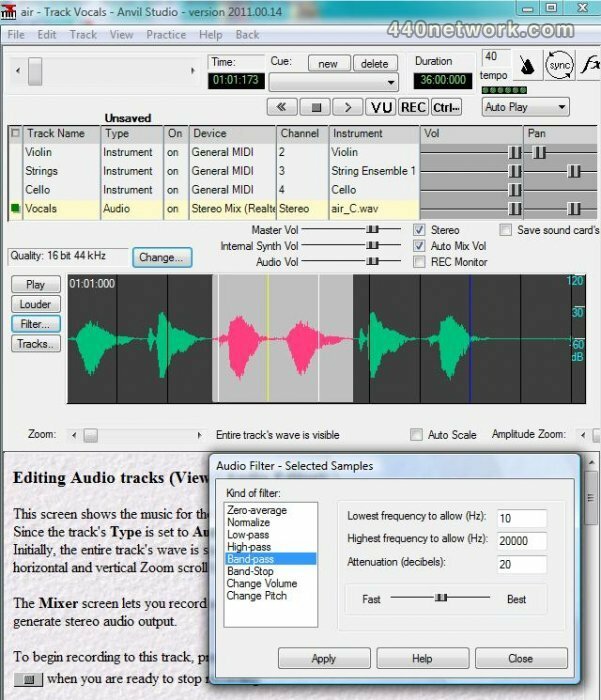 Punch-In now supports MIDI recording the same way it has always supported audio recording. Not all VST-Instruments respond to MIDI events for Volume and Left-Right Balance (PanPot) so we added a checkbox named This VST-Instrument responds to MIDI Pan and Vol to the View / Synthesizers screen. This is set by default. If you discover that a VST-Instrument does not seem to respond to the View / Mixer screen's Volume or L/R Balance control's, uncheck this checkbox. That will cause Anvil Studio to use those controls to alter the track's Audio volume. When using View / Note Properties to change the duration for range of notes, if the checkbox Shift Following Notes is unchecked, the location of the notes will not be changed. When changing to ASIO mode, Anvil Studio now first releases the Microsoft GS Wavetable Synthesizer so that it will not prevent the ASIO Driver from accessing the Audio Out device. Some improvements were made to how tied notes are displayed on the staff. In earlier versions, some songs whose tempo changed over time went silent when played to VST-Instruments. A bug was fixed that caused the File / Open and Play menu to report the file was not found when the folder was different from where the previous song had been loaded/saved. Added splitter bars and scroll bars to Piano Roll editor to make it easier to resize panels and scroll to desired notes within the panel. Increased the maximum volume of samples when played back in a song. For tracks played by a VST-Instrument, changing the track's Pan/Volume now has an effect even if the VST-Instrument does not respond Pan/Vol MIDI Events. MIDI effects parameters can now be edited within a loop with Pro-Mix. Added a Lock Score checkbox to the Piano Roll / Rhythm editor. When using the Audio editor's Filter / Change Volume, if the selection was made right-to-left instead of left-to-right, it was not altering the correct selection. This version now supports more VST-Instruments. When a track was assigned to a VST-Instrument, composing by playing notes on an external keyboard was not causing the notes to be echoed by the VST-Instrument. File / Save would sometimes warn that two tracks had different time signatures, but would not correctly report what the time signatures were. FX button / Properties / Save Presets button would incorrectly report an error. In Percussion staff editor, in version 2012.03.01, addint a new drum to the palette would incorrectly report an error. File / Repair Song was sometimes removing the wrong redundant pitch bend events. Since version 2012.04.02, File/Export Mixed Audio was doing nothing. Metronome was sometimes not working properly. Added View / Options / Make Anvil Studio my .MID file player. When dragging notes from the palette to the staff, as the mouse is moved left and right, a box at the top of the window tells the time where the note will be inserted. The staff displayed when --no grid-- is changed has been improved. A more useful message is displayed when an error occurs while using VST-Instruments. When a VST-Instrument was added by pressing the FX column, it was not echoing entered notes when composing. Several other bugs were fixed. This version does not uninstall the 2011 version, and you can move back and forth between the 2011 and 2012 versions. Both versions have compatible file formats. After you feel comfortable with the 2012 version, you can use the Control Panel to uninstall the 2011 version. Added Undo/Redo for drawing in automation window. Added Duplets and Septuplets to the staff editor. Playing songs that included audio samples was not working right. It sometimes could not select the last note on a track. File / Print, and changing the number of staffs per page could cause Anvil Studio to incorrectly report that the song had file format errors. VST-Instruments would not echo entered notes after playback. Using View / Performer to run a program using an external MIDI keyboard to play sampled sounds was not working properly. Using View / Performer with Arpegio tool sometimes failed. Latency with CoreAudio sometimes reported Audio Out latency of close to 1 second when it should have been close to 0. With some VST-Instruments, it would erroneously complain that it was unable to mix and play fast enough. Edits to a loop sometimes did not prompt to save changes before closing the file. In versions since 2011.11.01, deleting a track appeared in View / Mixer's track list before a track that had loops could cause loop references to become invalid. File / Export Mixed Audio and View / Latency / Analyze / Start sometimes complained that there are no Audio In devices even though none were needed for this operation. View / Upgrade Anvil Studio would sometimes report that it was unable to re-launch Anvil Studio because a file was not found. Improved the Help / Tutorials menu.